Earlier, in Gift Business: How Do People Buy Gifts? (Part 1), we covered the individual steps of the gift giving process. Here, in Part 2, we will take a look at innovations that improve, replace or eliminate these steps. We have already talked about the gift receipt innovation in our previous post. The logical follow up is the gift card. Aiming to make the entire process even more efficient, the gift card eliminates the SPECIFIC GIFT substep entirely for the gift giver, and makes the DELIVERY step easier, by reducing the size of the gift significantly, sometimes entirely, in the case of electronic gift cards. Because of its convenience, a number of new business models emerged around the gift card idea. We are not merely talking about existing online and offline retailers, like Amazon or Starbucks selling their gift cards, but rather about new businesses that make concepts previously deemed impossible or impractical come to life. Outsourced gift card services is one such concept. For retailers that do not want to implement a gift card service by themselves, either because they are not tech-savvy enough or simply do not want to make the necessary investment, companies like CashStar provide a practical solution. CashStar’s digital gifting platform lets B2C and B2B retailers integrate a complete e-gift card service to their offering. Customers can create personalized e-gift cards with their own text, photos and videos, then send them to recipients via the retailer’s website, mobile site or even Facebook. “It works like this: You sign up for Wrapp, either on the Web site or via the mobile app, by connecting directly to your Facebook account information. Wrapp notifies you of each friend who’s having a birthday, say, or who’s gotten engaged. 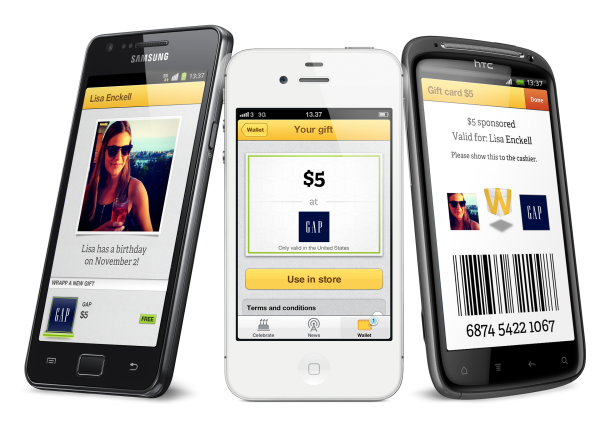 Then, because of the targeting options it gives its retail partners, Wrapp will match its offers with information about the person you want to send a gift card. The choices you’ll see for a woman 18 to 25 are different than those for a man in his 40s. Sloan believes that the beauty of the model is not how it works for the user, but the way companies like Wrapp have convinced their retail partners to give away free gift cards. Companies treat these cards almost like coupons, and gladly give away cards of a certain value because they know full well that recipients will either add more money to the card or that when they come to the store to redeem the card, they will end up spending more than just what is on the card. There are others, as always, who look for the niche within the niche. 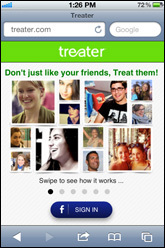 Treater is a gifting platform for sending casual, spur-of-the-moment, consumable, low price gifts. It does work under the same principles as its larger rivals, but unlike them, it focuses on everyday treats, low cost items and local businesses instead of formal occasions, big ticket items and national brands. The idea is that next time a Facebook friends posts a status update on what a bad day they are having, you can send them a cup of mocha to make them feel better or when a friend announces a promotion at work, you can give your congratulations by treating them to a burger for lunch. Even though gift cards provide recipients with the flexibility of making their own decision at the SPECIFIC GIFT step, there is always the possibility that the recipient may not exactly be happy with the LOCATION, or even the GENERAL IDEA. In such a situation, the recipient could be stuck with an unwanted gift card. This is where gift card exchange services come in. Exchange services such as Cardpool or Plastic Jungle allow gift card owners to either sell their gift cards, or trade them for another gift card of their choosing, at a discount. The process is fairly simple. Once the gift card owner enters the gift card information (merchant, amount, card number) on the exchange’s website, the exchange will make the gift card owner an offer, if they want to sell the card, or display trade options, if they want to trade the card. Most gift cards can be sold or traded online, without the need to visit a store. “…it sometimes occurs that gifts purchased on-line do not meet the needs or tastes of the gift recipient. For example, the recipient may already have the item and may not need another one of that same item. Alternatively, the item may not be the right size, the right type, the right style, and so on. In such situations, the recipient may wish to convert the gift to something else, for example, by exchanging the gift for another item or by obtaining a redemption coupon, gift card, or other gift certificate to be redeemed later. 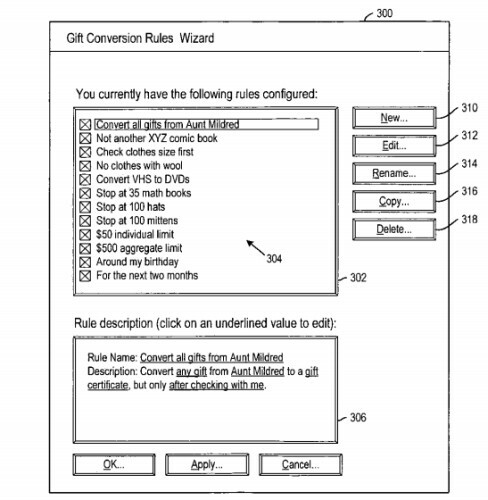 The patent’s basic idea is a system by which a recipient’s gifts will be converted into things they actually want, through personalized lists and filters. Similar to email filters for products, potential recipients set up a personalized series of rules, and if any gifts sent through the online merchant trigger these rules, the recipients are sent either an item from their Amazon Wish List, or a gift certificate instead of the unwanted gift. While innovative, the system drew sharp criticism from not only traditional minded gift givers, but also from etiquette experts. The system was accused of being “dishonest” and while returning gifts that will not be used is deemed acceptable, returning gifts before even receiving them is considered to take the focus away from the appreciation of being given a gift. 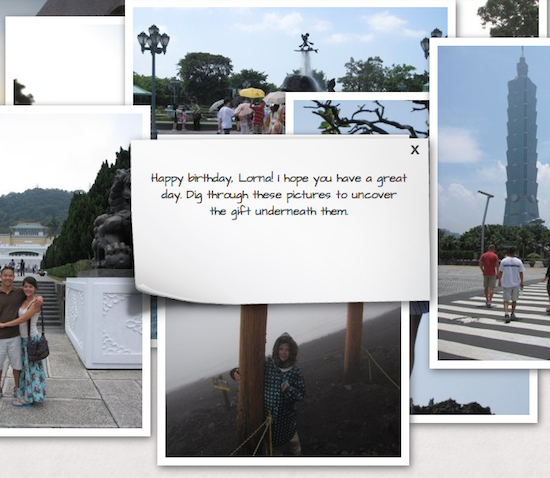 The balance between pragmatism and the spirit of gift giving we like is that of Wantful. The company enables gift givers to choose gifts and create a small catalog of gifts. The recipient is sent a beautifully designed and personalized hard copy catalog that allows them to choose a gift, which is later sent to them in the mail. It is almost like a nice compromise on all fronts: the gift giver gets the convenience of not having to go to the store and the post office, while the recipient not only gets a nice, “hands on” catalog, but also has a degree of freedom in choosing a gift they want, without the hassle of having to return an unwanted one. Yet another innovative concept is group gifting. Uniting the resources of many gift givers into a gift card enables the recipient to receive a more expensive gift they actually want, instead of many small valued and mostly unwanted ones. Group gifts not only make it possible for the gift givers to co-buy a gift of larger value, but also let the recipients choose or sometimes even predetermine their SPECIFIC GIFT. A number of models have emerged around the group gifting concept. eBay’s Group Gifts is one of them. Once the gift fund is set up via an eBay and a PayPal account, gift givers can be notified via email or Facebook, and contribute to the fund with their credit cards. No one gets charged until everyone chips in, and once it is fully funded, the gift fund will be sent to the designated PayPal account, and the recipient can checkout the same way as they would normally purchase any item on eBay. It is a simple system that combines existing infrastructures of eBay and PayPal into an innovative service. DreamBank‘s model is slightly different than the average gift fund. Rather than focusing on items as gifts, the platform lets a recipient set up a fund for their dreams and enable gift givers to fund the recipient’s dream, which can be anything from a Caribbean cruise to an anniversary party, from a certificate program at the local university to ballroom dancing classes. The service is built as a community, so the recipient and the gift givers can interact over time with each other by sharing progress, resources or even encouragements. Gift givers can also set up a DreamBank account for unsuspecting recipients and surprise them after the dream has been funded. SocialGift provides outsourced group gifting services for existing online retailers. Similar to what CashStar is doing for gift cards, SocialGift provides retailers with a plug-in for their product pages. 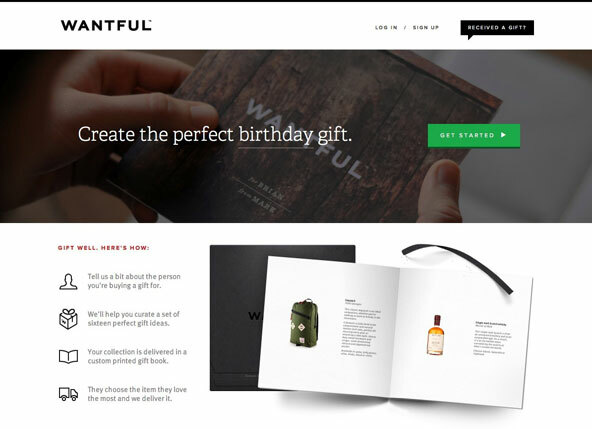 Customers can create a group gift directly from the retailer’s online store via an event page. Through the event page, gift givers can determine how many people will contribute, track the progress of funds raised, invite more people to contribute or socialize with other gift givers. The gift is shipped immediately, once the funds have been raised. If the gift is underfunded by a predetermined date, a gift card for the amount raised by the group is sent to the recipient. While all the innovative concepts mentioned in this post so far have touched upon, utilized or modified most of the steps of the gift giving process, one step alone is outside the scope of most businesses: WRAPPING. This is where Delightfully comes in for digital gifts. We have only talked about but a small subset of innovations and new businesses in the gift space. Undoubtedly, some of them will prevail, while others will not. John D. Rockefeller once said that “the power to make money is a gift from God.” Which of the businesses and innovations we have covered have received that gift, and which of them will convert that gift into their own gift cards? Time will tell. Gift giving is a universal phenomenon. From the Holiday Season to Mother’s Day, from Valentine’s Day to Graduation Day, from birthdays to weddings (not to forget anniversaries) literally hundreds of millions of gifts exchange hands every year, making both givers and receivers happy. While many people give gifts the “traditional” way, others utilize new technologies and services. We are going to cover the Gift Business topic in two parts. In this post, Part 1 of the series, the individual steps that occur during a gift giving experience will be discussed. In Part 2, we will take a look at how new technologies and services can improve, replace or eliminate these steps. In this post and the next one, however, we are going to follow our own framework. The gift giving process starts with a NOTIFICATION. The NOTIFICATION can be external, such as receiving a wedding invitation or a birthday reminder email, although it can be internal as well, where you remember your child’s birthday, or just feel like rewarding your team at work. This is the stage where “whether to get a gift or not” decision is made. If a NOTIFICATION results in a go-ahead, it is generally followed by the SELECTION step, with its three substeps: GENERAL IDEA, LOCATION and SPECIFIC GIFT, although not necessarily in that order. The steps we covered so far involve many research, analysis and decision activities on the gift giver’s part, which we will not discuss in detail. There are tools, many of them online, that help gift givers research various dimensions of gift options, analyze their viability and price/value ratios, as well as make relative and absolute comparisons to decide which gift will ultimately yield the optimal outcome for both the giver and the recipient. While it would be interesting to take the process map one level deeper, and look at these processes and tools in the flow, for the purposes of this discussion, we are going to stick to the high level steps. The next step is PAYMENT. After the gift giver decides on the method (cash, debit card, credit card, installations, coupon, existing store credit) they must also make a very cruical decision which affects the rest of the process: whether to get a gift receipt or not. While the more traditional minded gift givers frown upon the idea of their gift getting returned and exchanged for something else, the more pragmatic minded gift givers always give the recipient the option to exchange the gift, which has become a standard service at retailers. Traditionally, DELIVERY is the last step of the gift giving process. A gift giver generally prefers to give the gift to the recipient in person when possible, usually in order to witness the happiness of the recipient firsthand. When a personal DELIVERY is not practical, usually due to factors such as distance, availability or size, a commercial delivery by either the store or a commercial delivery service is arranged. Although it does not affect the steps of the process by itself, the gift receipt innovation, mentioned at the PAYMENT step, has altered the flow of the process. Rather than ending the process at DELIVERY, a gift receipt has the potential to set the process back to the SPECIFIC GIFT step, by giving the gift recipient the choice between keeping the original gift and exchanging it for something else. 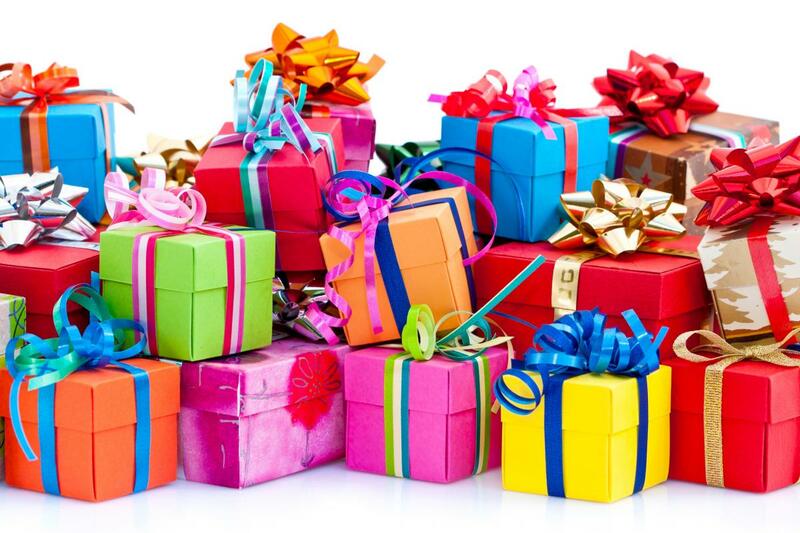 As mentioned earlier, traditional minded gift givers dislike the gift receipt, because it not only makes the entire original SELECTION step irrelevant, thus overriding the original intent of the gift giver, but also reveals the actual monetary value of the gift, which is considered to be impolite. In contrast, progressive minded gift givers defend the gift receipt, claiming that it gives the recipient an opportunity to exchange an unwanted gift for a better one, increasing the recipient’s utility, and after all, is not the gift giver’s ultimate goal just that? So far, we have examined the individual steps of the gift giving process. In Part 2, we will take a look at various innovations that redefine the process, its flow, as well as one or more of the steps. A new study of 163 CEOs, senior strategists and communications professionals, conducted by Forbes Insights and FD in conjunction with the Association for Strategic Planning and the Council of Public Relations Firms, looks at corporate strategy development and implementation. Of special interest was the interdependence of strategy and communications in creating and executing a successful strategy. What business should we be in? So, if senior management does not have a common definition of strategy, that means they are not on the same page in regards to the three questions above. Am I the only one who finds this extremely disturbing? Luckily, I am not. Mitch Ellner, CEO of CNC Strategy Cloud Solutions, talks about this in his post Strategic Planning – the “Strategy” of all 3 Resources. With three resources, he means people, processes/information and finances.